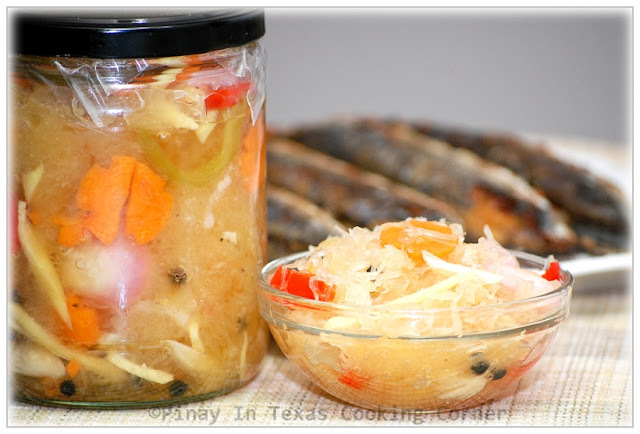 Atsarang Papaya (Filipino Pickled Green Papaya) is a famous appetizer in the Philippines. Though there are many variations of atsara (which refers to anything pickled), green papaya version is the most popular to Filipinos. It's because papaya tree grows just anywhere in the Philippines. And unlike the labong (bamboo shoots) and ubod ng nyog (hearts of palm) which are the other two most common atsara ingredients, papaya is more readily available. You can always find it in the market and a lot of families have a papaya tree in their backyards. Last week, a Filipino officemate of Ryan gave him a jar of atsarang papaya. He ate it for dinner on two consecutive nights until it's all gone. Last weekend when we were at the Asian Store, he saw some green papaya. Out of nowhere, he said he's buying one and will try his mom's atsara recipe. I know my husband cooks good...but cooking isn't something he does frequently. Though he cooks breakfast or dinner on weekends, it's just either fried or grilled. He only does real cooking when we're having a party at our house. He's really not a kitchen person you know. So when he said he will make atsara (which I don't really like doing myself because of the shredding involved), I got so thrilled because I really miss the atsarang papaya my mom used to make which is actually the same as my mother-in-law's version. If you like pickled vegetables...you should try this! It will definitely add life to dull dishes like fried meat or fish! * I'm linking this up on Melt in Your Mouth Monday , Mangia Mondays, Made It On Monday, Hearth and Soul Hop, Delectable Tuesday, Tuesdays At The Table, and Made From Scratch Tuesday. 1. Drain the liquid from the finely shredded papaya by squeezing out as much liquid as possible. Put in a bowl and set aside. 2. In a saucepan, combine vinegar, sugar, salt, peppercorns, half of the ginger and half of the garlic. Keep on stirring until sugar is dissolved. Bring to a boil. 3. Add all the ingredients except the papaya. Mix well. Remove from heat. 4. Allow to cool down. When the mixture is lukewarm, pour over the grated papaya. Mix well. Let sit for 2 hours, tossing every 30 minutes. 5. Transfer the mixture to clean, dry jars with lids. Let cool and refrigerate. Allow to sit in the refrigerator for at least 12 hours before using. 6. Serve with fried meat or fish or as desired. I will love that Tina .. the recipe is amazing. Can you make the same with cucumber ? Yes, Kankana! But for Pickled Cucumber, bell pepper is omitted...and instead of grating, the cucumber is just sliced. I love pickles!!! Your husband has done a great job! Well done and thank you so much for sharing! OMG, what a lovely appetizer, we love this and it is very popular too at Malaysia although the ingredients and cooking method is slightly different. yummy yummy. Wow! What a great recipe! My cousin is Filipino and I'm going to tell her about your blog! She'll love it! Her mom is back in the Philippines now so she doesn't get to eat her mom's cooking all that much. Thanks for sharing! This looks really interesting. I am going to have to try this recipe. We make pickled cucumbers, cauliflower, cabbage and several others but not papaya! This one is so different, I am curious how it tastes! it taste sweet and sour. Best compliment for bbq or any fried dish. Sounds so different! Do you just est it by it's self or with bread or something? So glad you linked up to Made it on Monday. I hope you will come back & share often. *On a different note, I was wondering if you would email me on hoe you went about doing the Bake Sale on line for Japan? I am in NEED of doing something similar for the Susan G. Komen Foundations 3-Day for the Cure. I really could use some help on how to do it. Would you mind helping me out? That looks very good...Your husband did a good job! 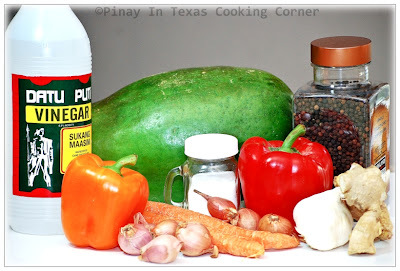 Great post and thanks for sharing at the hearth and soul hop 44.
green papaya! such an asian thing (: yum! will make this recipe this weekend and let my new Canadian friend try it, he just love asian food. hmmmm so excited! hi Tina its amazing.i am cooking filipino special food for business and ur sites really did a great help.i live in hongkong. I'm really glad to be of help! Hi Tina, Do you know how to make those red salty eggs? Do you know if you have to hard boil them before pickling them in salty sater? And do you by chance know how long you have to leave them soaking in the salty water (days/weeks?) Thanks for your help. I love your website, each time I look for a recipe, I try yours first and yours are really super easy to follow and each recipe I've tried is delicous! I've tried making salted eggs before using chicken eggs because I couldn't find fresh duck eggs here. You don't boil the eggs before soaking them in brine. Just wash 1 dozen eggs then dry them using paper towels and place them in a clean large glass jar. Place 1 1/2 cups salt and 5 cups of water in a pot and boil until salt is completely dissolved. Allow the brine solution to completely cool down before pouring it over the eggs. To help the eggs stay submerged, fill a small plastic bag with water, seal it and put it on top of the eggs before placing the jar lid. Store the jar in room temperature for 25 days. Wash eggs then boil for 20 minutes or until fully cooked. Run the eggs under cold water then drain before serving. 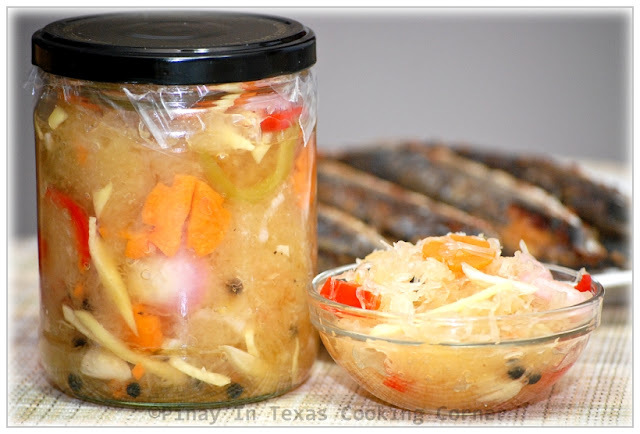 sourkraut instead of green papaya. It's seasonally available in most Asian stores here. I guess you should check the Asian stores near you.